This landscape for a large residence in the Virginia suburbs outside of Washington, DC includes an entry and drop-off court, a large outdoor pool terrace, several wooded gardens, and a contemplative terrace organized around a reflecting pool. The Rodrigues family emigrated from Portugal and conceived of their house as an homage to the estates of their childhood. The design approach for the landscape extended the formal, classical language of the residence out onto the site itself. The site is organized as a series of garden rooms, each with a distinct character. These spaces revolve around a large pool terrace paved with intricate brick patterns. Two gardens extend from the main terrace: a Sun Garden, with a central turf panel and perennial borders, and a Shade Garden, with a double row of lindens above perennial plantings. 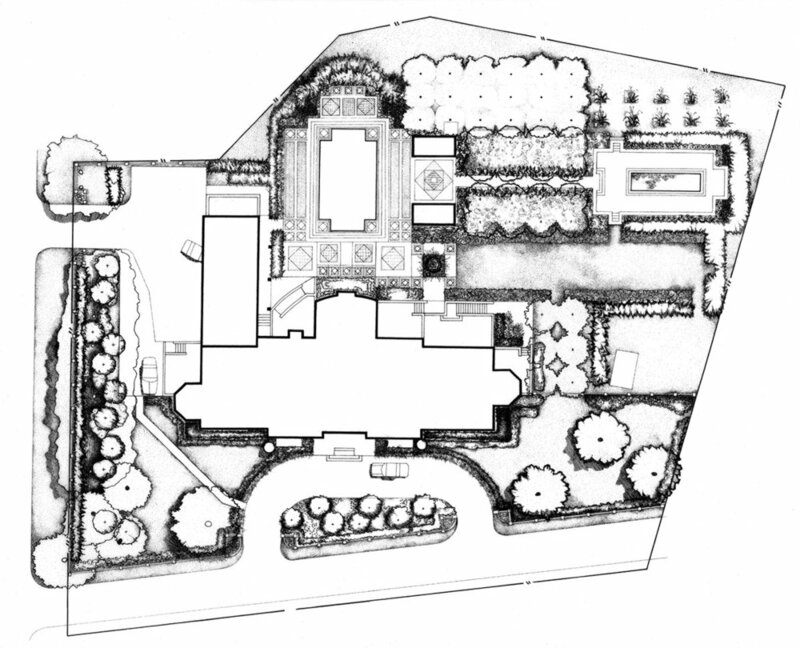 The Shade Garden leads to the Secret Garden, which is visually separated from the residence and expressed as a sunken rectangular terrace surrounded by tall, evergreen hedges. At its center, a contemplative lily pool with small fountain jets provides a quiet counterpoint to the more active parts of the landscape.